Any other scenario is fraught with risk of cannibalization, not just to its iPad but to its iPhone and iPod Touch products as well. “one thing we’ll make sure is that we don’t leave a price umbrella for people” in the tablet space. The chart we see on the left is simply a representation of Apple’s current price points using bar-chart. From the iPhone and iPod examples it asks us to make a leap of faith about iPad. Strategy is not about nicely completed artificial triangles. 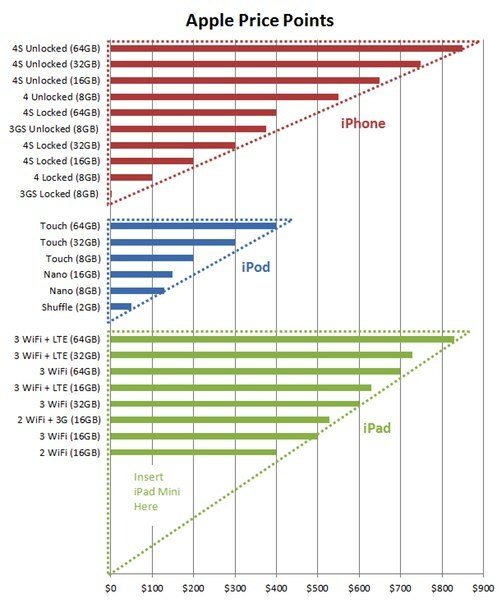 Absence of iPad in the lower price points does not point to a gap but Apple’s choice for profit share and not market share. If filling the gaps in the price points is the driver then you we should have several sub $500 laptops and desktops from Apple. Just open the flyer from Fry’s and count the number of laptops available in the $400-$700 range and compare that to the price of MacBook and Macbook Pro laptops. Shouldn’t Apple be worried about yielding that market to others? This is not to say there will not be a iPad Mini but pointing out that the case being made for iPad mini lacks any kind of rigor or evidence. The gaps in the price points says nothing about the segmentation or the demand. Nor does it say what happens to demand for current products when a newer cheaper one comes along. This is the representation of the demand for iPad and iPad mini. We do not have data on how these demand curves look like. May be Apple has this information. What this chart tells us is the impact of the demand for $499 iPad when there is a $299 iPad mini. As long as the profit from iPad min sales exceeds the lost profit from cannibalization of other products, Apple will introduce iPad mini. Not because they do not like gaps in someone’s bar-chart.